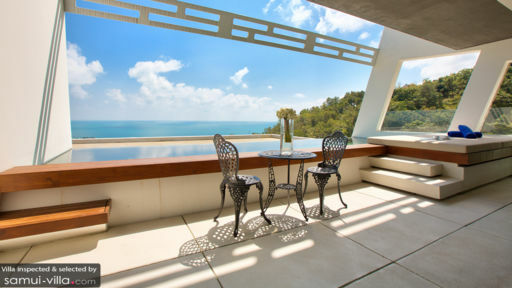 Aqua Samui is a newly-built boutique property development in Koh Samui, Thailand, which has several 2-bedroom and 3-bedroom private villas complete with stunning sea views and lounge areas. Chaweng beach and the Gulf of Siam are all visible from these villas as they are the most coveted and splendid of all parts of the island. The property hosts five, 2-bedroom villas of which four are classic villas and one is a deluxe property. The villas are designed with care to offer a world-class experience with en-suite rooms and a view that will put all your worries to rest! Two bedrooms are found in each of the five villas, one of them being the master bedroom in the deluxe villa. The bedrooms feature large glass walls that provide memorable and exciting views of the outdoors including the sea, lush vegetation, and the sandy beaches. You will find the rooms to be extremely comfortable and inviting, essentially a home away from home. The bedrooms are even equipped with en-suite bathrooms complete with necessary amenities including a large shower area. 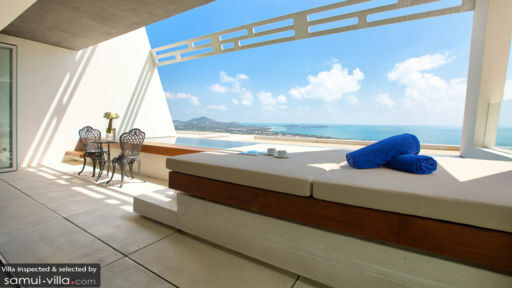 Each of the villas at Aqua Samui features its very own swimming pool for a completely private and exclusive experience wherein you can lounge on the sunbeds without a worry, swim laps around the pool, or simple enjoy the peace of the region. You can get endless views of the sea from where you are lounging, and inhale the fresh island air to release all the city toxins from your bodies. Sunbathing and napping could quickly become your two, favourite activities, what better way to spend your holiday! The living areas at the two-bedroom villas start out from the terrace that has been furnished with rattan chairs, a cute spot for some morning tea. 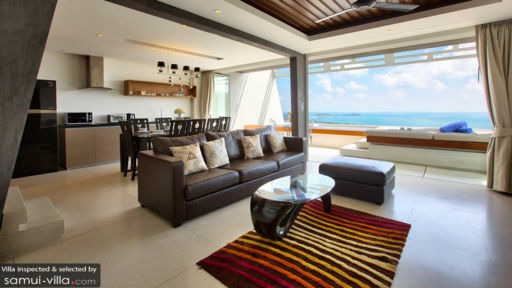 The living area itself is open-plan and you can get the most beautiful panoramic view of the sea right when you’re relaxing on the comfortable sofas in the room. Separated by an arch, the living and dining area features a seating with an L-shaped, grey sofa that sits facing a wall-mounted, flat-screen TV for your enjoyment. You can choose to shut the glass doors, if you wish for a quieter, and cooler ambiance. The dining area comprises a four-seater, contemporary dining table set to the same grandiose view, so you can enjoy hearty meals with a beautiful backdrop. The deluxe bedroom even has a sofa bed extension. Finally, there is the well-equipped modern kitchen which has been fitted with all sorts of amenities and appliances that guests can make use to cook for themselves a delicious meal, or request for a chef to prepare local fares. The Aqua Samui development offers its guests a once-in-a-lifetime experience as they provide several amenities including extensive spa services list that is made available to guests including traditional Thai practices for the most tranquil time, and plenty spaces that are conducive to the panoramic sea views around the villas. A gym/health club and a restaurant/ bar are expected for the second half of 2018. The neighbourhood for Aqua Samui is one that is bustling with the best restaurants, beach bars, shops, and places of interest. Head to Chaweng for a fun night out, or even to explore the beach for all its peaceful and tranquil vibes. Lamai beach, another popular spot, is home to some of the best nightclubs to unwind. If you’re interested in diving, then Ang Thong National Marine Park or Ko Tao are two of the recommended dive spots!